Hello Games are four friends that left their very successful careers with UK developers such as Criterion, Sumo, Kuju, EA and Climax to go it alone and live the indie dream by creating their own studio. Although they have loved every minute of helping to create great games like Burnout, Geometry Wars Galaxies, Sega Superstars Tennis, MotoGP and Black, the time has come for them to forge their own path. They must unleash the unexpressed charm and creativity hitherto stopping them from sleeping at night. Hello Games say their desire is to “make games that will put a stoopid grin on your face”. Their first title Joe Danger will make most gamers who are beginning to tire of yet another Gears of War or COD sequel sit up and take notice. 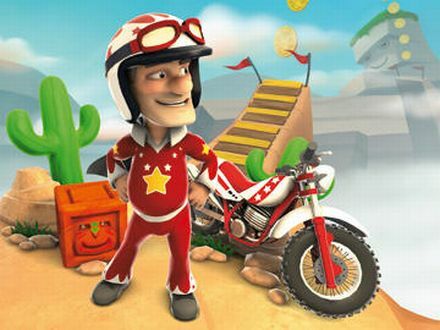 Their debut game, Joe Danger, is aimed at digital download and is due out on PC, PlayStation Network and Xbox Live Arcade in spring next year. The game appears to be inspired by the great Evel Knievel with his best days are behind him, he’s put on a little weight, the Doctors told him he would never walk again and he is left looking at faded posters of the glory days of yesteryear. This game follows his inspirational comeback and it’s going to be out of this world. If you hadn’t guessed, you are Joe Danger. You live to thrill the crowd and break World Records. Take on your friends or race against your rivals, the reckless “Team Nasty”. You laugh in the face of danger, and it laughs back, as you bounce from boulder to boulder, on fire, towards that pile of mousetraps. Freeze the game at any point and edit your level however you want it. Once you are finished, share the joy. When I say that the game is essentially a 2D stunt racer/platformer you could be forgiven for immediately thinking “so it’s another Trials HD, right?” but that would be doing Joe Danger an injustice as it’s a very different kind of game. The controls are much more forgiving and the focus seems to be much more on fun. For example if you get one of the letters that ultimately spell out the word D-A-N-G-E-R and you’ll trigger a sample from a popular eighties power ballad. Word on the street is that they have already created over 150 levels, although they expect to get that down to around a more realistic 50 for the finished game. We were lucky enough to play a little of the game at last year’s Eurogamer Expo, I have to say its very refreshing to see developers leaving the corporate developers with the dream of simply making fun games. Check back tomorrow for our exclusive interview with the boys themselves!